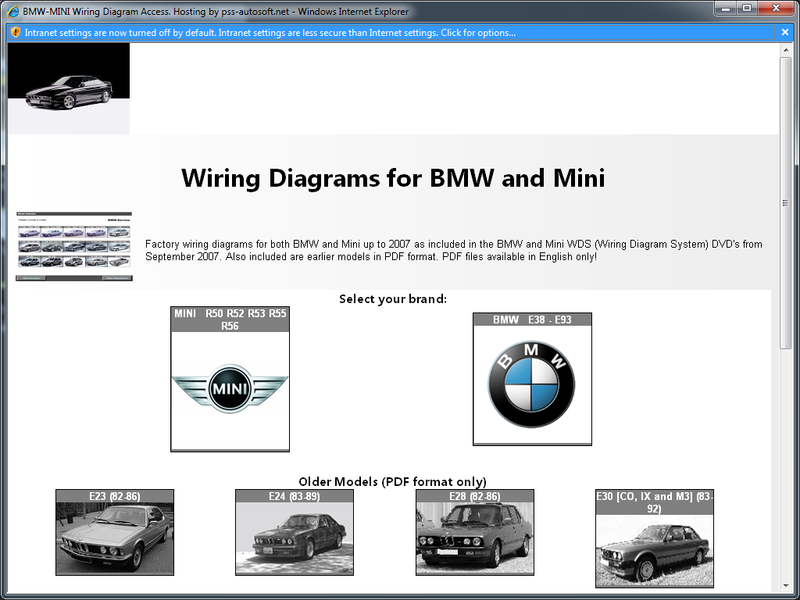 Introducing the pss-autosoft version of the BMW and Mini Wiring Diagram System (WDS). The WDS from BMW is readily available from many sources but they ALL share one common issue. They were designed and intended to work with a specific configuration - one that is no longer easily possible to duplicate with modern computers. In other words Windows XP or older operating systems, that had NOT been updated to Internet Explorer 9 or newer. NOTE: This is for ORIGINAL BMW or MINI WDS, not ours! Will open a new Window! Internet Explorer 5.5 (long obsolete) Internet Explorer 6, Internet Explorer 7 and Internet Explorer 8 are the only browsers that the OEM BMW or Mini WDS will work with. This issue is hard-coded into ALL the original BMW or Mini WDS. So for those who are using any current version of Windows, these requirements eliminate everything past Windows 7. For Windows 7 or Vista this is only if Internet Explorer 7 or 8 is still installed - which with the Microsoft automatic updates, pretty much eliminates both Vista and Windows 7 too. And really, nothing else will function. Period. If you did try to make it work on something else you were limited by the issue of the original image files being specifically coded for use with the Adobe SVG plugin (which is obsolete since modern browsers have built in SVG Support). This special coding was what made the original WDS so powerful. (See the above "Help" button) Each image had links embedded into the file that would allow you to instantly jump to any related system in the navigation tree, which allows user to quickly track a circuit and all its branches. Unfortunately there are many vendors offering a BMW or Mini WDS that is not at all usable under normal conditions. In order to make it work you have to play with the settings in Windows, change operating systems to use it at all. And naturally no seller tells you this before you purchase. That means that for the original distributions, when used on any system other than the operating systems/browsers that met these requirements, you could (with tweaking) at the very best view the images for the diagrams, but not navigate to any related images or documents. 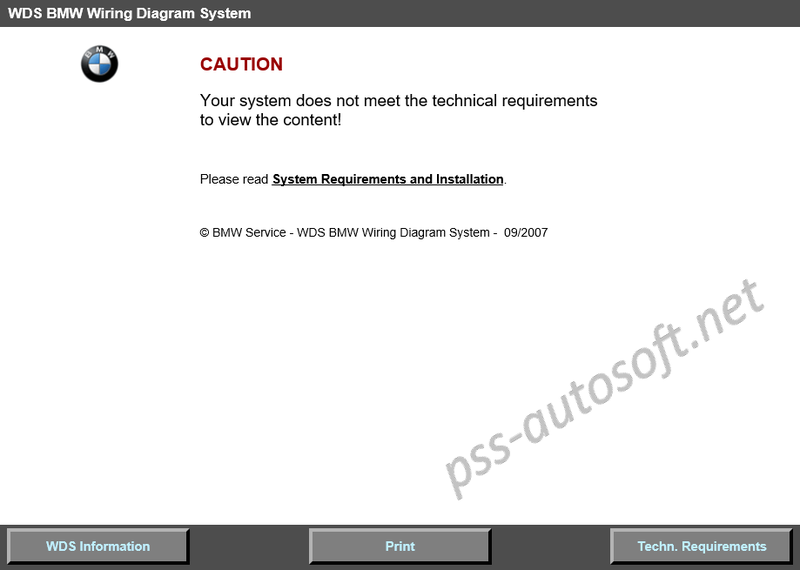 This video highlights the problems with any standard BMW or Mini Wiring Diagram System (WDS) DVD. The first portion shows you a functional use - on Windows XP with an early Java Runtime installed. Then we show on Windows Vista, Windows 7 and finally on Windows 8.1. Then we finish the video with the fully functional pss-autosoft.net version of the BMW and Mini WDS on a single DVD. running on the same Windows 8.1 system. 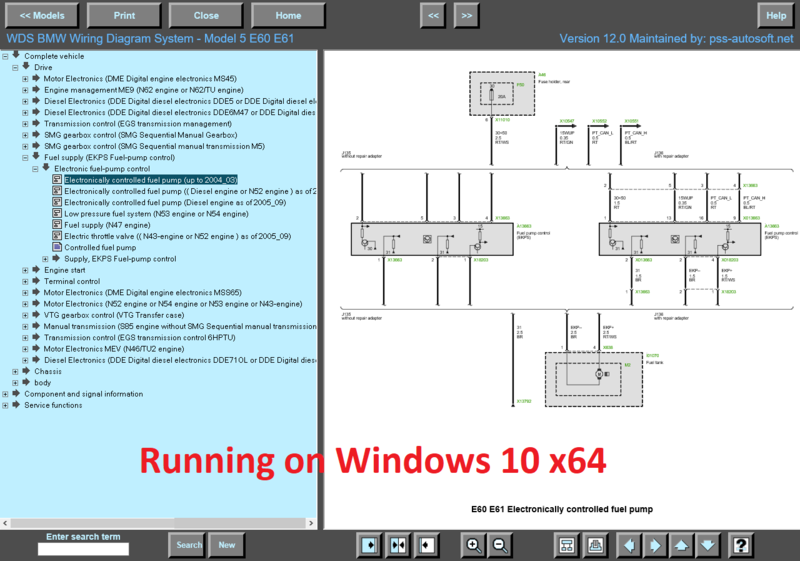 Our version of the BMW and Mini WDS has been completely rewritten to function correctly on any modern version of Windows, from XP with Internet Explorer 8 through Windows 10 with Internet Explorer 11. And by function correctly we mean, the internal testing to validate the operating system and browser, the internal links are all 100% functional. It does not matter if you have a 32 bit or 64 bit version of Windows, it works. Our system can be run right from the DVD, or if you have a space 1.8GB of disk space, you can install to the hard drive. 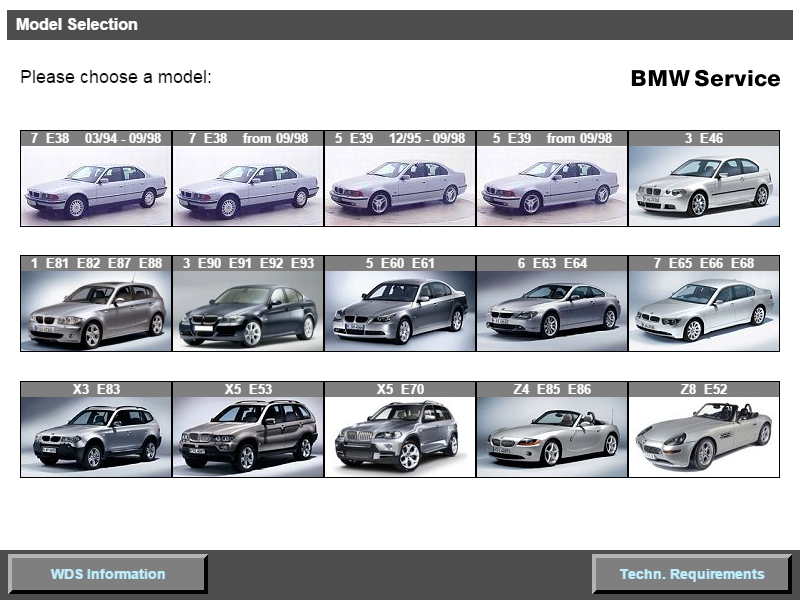 What is different in the pss-autosoft.net WDS from the original BMW release? The original BMW and Mini release contained just BMW or Mini files, and included all available languages. Our version includes both BMW and Mini on a single DVD but has only a single language. All languages are available individually. Note that the content is identical between languages EXCEPT for the text. All images, diagrams etc. are the same in every other respect other than the written language. Above you saw a video of the failures of the standard BMW or Mini DVD that you will find from many sources, ebay, Amazon, forum shares. And they all share the same faults - they will NOT work correctly, if at all, on any thing other than the intended browser or oprating system. With the pss-autosoft.net BMW and Mini WDS you get 100% functionality. You don't have to find an old computer to run it on, you do not need to get a system with a XP Virtual machine (as some have done and sold - where is the COA for that XP install?? ), you just install the program we provide and run the WDS. This is a video captured from a system using the pss-autosoft.net WDS system on Windows 10 64 bit. We run through most of the functions and as you can see, it is running natively on the Internet Explorer 11 with the latest Java Runtime (8.151) without any faults. Click here! to go to the purchase page Click here!